If you think no movement has ever faced what the climate movement is now up against, and won, then it's time you learned about the Nuclear Freeze campaign. Thank you, Duncan, for this thoughtful analysis of two social movements confronting existential threats. I have a bit different perspective on The Freeze, as an active nuclear abolitionist since 1978 who did not directly campaign for a Freeze because, well, why campaign for crust when we need the whole loaf to survive? The idea of simply a Freeze on warhead production was never enough. The idea of the Freeze was trumped by technology that enabled the US to gain the propaganda value of one-upping The Freeze by actually reducing deployed warheads. Disarmament treaties initiated during the Reagan administration just cut redundant, technologically obsolete delivery systems. Add this to the technological, investment, and propaganda appeal of a Star Wars missile shield, and the Freeze was rendered meaningless as disarmament campaign. Indeed, there is no place to go when your vision no longer has political meaning. Arms control is just another diplomatic career specialty, not a substitute for disarmament. Ronald Reagan may have felt the mood – he was politically sensitive – but the Pentagon had other plans, some only bearing fruit now with the trillion-dollar rebuilding of the entire U.S. nuclear weapons production and delivery capacity. It’s hard to say the Freeze won much but a temporary reprieve, if that. Nuclear weapons remain an existential threat. Unmentioned here is the impact on Soviet policy of the Nevada-Semipalatinsk Movement, itself inspired, as the name suggests, by the 1980s nonviolent direct action campaigns at the Nevada nuclear weapons test site. 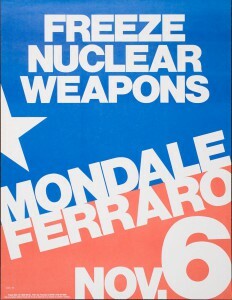 The Freeze dallied with endorsing nonviolent direct action via the American Peace Test organization, but rejected this opportunity to leverage the power of nonviolent action beyond mere arms control and instead pursued the legislative agenda (and quick demise) that Duncan notes. It is worth noting that the nonviolent direct action movements were critical in England and Europe to the opposition to Cruise and Pershing missile deployments, even if those were also technologically obsolete delivery systems by then. It is a pity that even to this day, the potentials of nonviolent direct action have not been embraced and explored by mainstream organizations critical of nuclear weapons. I believe many activists might take the risks, but for a lack of any apparent organizational backing. Therein lies a lesson I hope some agitating climate change organizations will learn. Thanks for the thoughtful feedback. This is a distinction that is worth drawing out — the climate movement *must* abolish the fossil fuel industry, in the near future, in order to accomplish its goals, and that’s something that a ‘freeze’ strategy doesn’t immediately do. However, I think there’s an important question to ask: why did the Freeze idea take off when the nuclear abolition/disarmament movement did not? Advocates for disarmament have been around since before the first nuclear tests — why have they never succeeded in making any serious political headway? I think it’s a real mistake to sit on the sidelines of significant political change because we hope for a stronger vision. The Freeze did what the disarmament movement failed to do for decades prior, which is actually reduce the number of weapons, and make the world safer than it was before. While the Freeze did not succeed in every way, I think if everyone had taken your position, we would be closer to nuclear apocalypse today than we are now (with all the attached dangers associated with testing, development, etc. ), and I’m not sure that’s a defensible stance. The Freeze shifted the ground out from underneath the military elites, and made many new things possible that weren’t possible before, and that’s more than anyone had been able to say before. I think your argument about direct action is very well taken, and this was a point that was raised to me by several Freeze organizers as well. From my perspective, mass public support is the crucial piece of any profound political change, and I think people still struggle today with how to link NVDA with forms of action that are accessible to millions of people at a time. Also, I wish I had a chance to really dig into the international collaborations that were happening at the time, but that’s (even more) out of my depth. I’m not asking that everyone “take my position” as you understand it. We just need to be careful about getting what we asked for. All that was asked for was a freeze on warhead production. Reagan trumped that, in spades, by eliminating the redundant warheads. Timidity answered by brilliance. Positions at the farther reaches of the probable can have the effect of making merely progressive positions seem palatable by comparison, and impel progress. That’s one potential leverage of nonviolent direct action. Somebody has to keep the disarmament option in the discussion when arms controllers won’t. 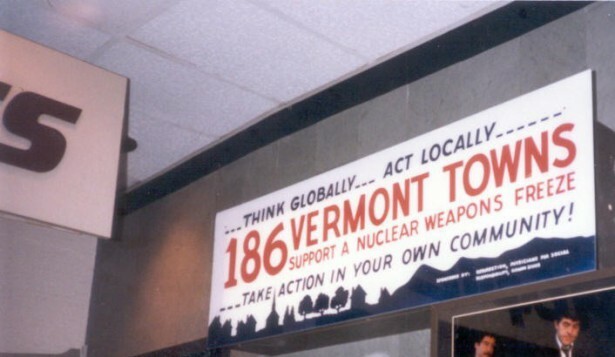 There is a huge difference between the anti-nuclear, anti-war movement, and the so-called climate movement. The former pitted people against the insanity of governments engaged in “mutually assured destruction” (MAD) of each other and the world. The climate movement asks the same and still insane politicians to fix the climate and the earth’s environment. With a ruling class of dummies eager and willing to obtain such enormous power, which the rulers will say is necessary to control the weather, expecting governments to fix the climate is but another form of mutually assured destruction. Wake up! Stop drinking beetlejuice! It rots your mind. The nuclear freeze / disarmament movement was VERY different than dealing with ecological overshoot, of which climate is part. Our industrial way of life, overconsumption, overpopulation, etc. is ultimately causing the climate crash. It’s good to blame the oil companies but that’s only a part of the problem — the way we all live is causing the crisis. Fossil fuels allowed our population to zoom from under a billion to over seven billion today. Solar power is great – I’ve used it almost a quarter century – but it’s not going to replace our current consumption (pun intended). Few in the climate movement mention the need to move beyond endless growth on a finite planet, or other ecological factors besides carbon that contribute to these problems. Few also mention that the fuels that power civilization have peaked in their flows, and on the energy downslope diverting any of them to create “alternatives” will become increasingly difficult. Transition Town has more promise as an approach than mere protests, but it’s not that popular. It would be nice to see environmentalists spend as much effort on teaching their neighbors and communities to relocalize food production as waving banners, but that hasn’t happened yet.